A crypto currency is a digital or virtual currency that uses cryptography to secure, create and control its transactions. Unlike traditional currencies, which are issued by central banks, crypto currency has no central monetary authority. Bitcoin is the first crypto currency which came to public notice in 2009. Following this a number of other crypto currencies, such as Ethereum, Ripple, Litecoin, Cardano etc. exist in the market. Crypto currency can be exchanged for other currencies, products, and services. 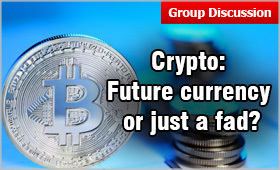 In recent months, Economists, Central Bankers and Monetary Experts have expressed their reservations on the future of this currency. Investors and Enthusiasts of this currency are however bullish. The total crypto currency market capitalization increased more than 3x since early 2016, reaching nearly USD 25 billion in March 2017. The current number of unique active users of crypto currency wallets is estimated to be between 2.9 million and 5.8 million. At least 1,876 people are working full-time in the crypto currency industry, and the actual total figure is likely well above two thousand as large mining organizations and other organizations that did not provide headcount figures are added. Bitcoin is the most widely supported crypto currency among exchanges, wallets and payment companies. The leading crypto currencies are Ethereum, Bitcoin Cash, Litecoin, Ripple and Iota. Vanuatu, a Pacific Island Nation, located in the South Pacific Ocean became the first nation to accept Bitcoin in Exchange for as payment for its citizenship program. While countries such as the United States, Canada, Australia, Japan etc. allow trade and investments in crypto currencies; there are countries such as Iceland, Vietnam, Kyrgyzstan and Bolivia where crypto currencies are totally banned. How does a Crypto Currency work? The technology behind Crypto functioning is Blockchain. A blockchain is a public ledger that keeps records of all prior bitcoin transactions. These data units or blocks use cryptographic validation to link themselves together. The entire network is used to monitor and verify both the creation of native tokens through mining, and the transfer of tokens/coins between users. Miners are individuals or organizations who, with the use of powerful computers carry out mining process. Mining is the process by which transactions are verified and added to the public ledger, block chain, and also the means through which new coin are released. The mining process involves compilation of recent transactions into blocks and finding solution of a computationally difficult puzzle. The successful miners who solve the puzzle get to place the next block on the block chain and are rewarded. The reward is twofold. The newly minted tokens/coins and the fees paid by users sending transactions are rewarded to the miners for their efforts. As a decentralized currency, Crypto currency cannot be manipulated by governments and central authorities of any country. Also because of its decentralized nature it is inflation averse. Unlike bank transactions, Crypto transactions are completely anonymous. A person can only know the addresses of crypto on which the payment has been sent and received. But to whom these addresses belong cannot be identified. This anonymity feature offers security against fraud and identity theft. Due to dramatic rise in its popularity among the masses it is gaining wide acceptance as a payment method. The fee for crypto transactions is relatively low as compared to other digital transactions such as credit cards and other modes. The mechanism behind crypto generation is highly complex which prevents duplication or creation of fake currency. A highly volatile nature, huge price change over a short period, of crypto poses a serious question to consider it as a future currency. The anonymous nature of crypto transaction attracts its usage for illegal and illicit activities such as tax evasion, weapons procurement, gambling etc. Crypto transactions are irreversible in nature. Funds sent to a wrong address cannot be traced back and result in loss of all the transferred money. If the storage device in which crypto currencies are stored gets damaged or lost. Then the lost Bitcoins cannot be recovered by any means. Cases of online hacking of crypto exchanges such as Mt. Gox in Japan, Bitfloormake etc. make it more risky. Since GD is a sort of debate, you should have a clear view point on the topic – either for or against. Do not switch viewpoints. However, if you have points for both for and against the topic, substantiate your viewpoint with well qualified data, examples or exceptions. You can conclude above topic by summarizing key facts on both point of views and conclude with the majority opinion, while respecting the minority viewpoint.